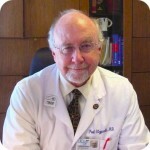 I am an endocrinologist, nationally board-certified in both Internal Medicine and Endocrinology & Metabolism. I am also a Clinical Professor of Medicine at UCSF, and author of the “Endocrine Disorders” chapter for a top American medical textbook, as well as the editor of my own textbook, Handbook of Clinical Endocrinology. My private practice is located adjacent to the UCSF Parnassus campus and hospital. My wonderful patients are the main reason I enjoy coming to work each day. My patients and I enjoy friendly and collegial relationships, based upon candor, trust, and mutual respect. I explain test results and provide copies of reports. I believe in preventive medicine and want my patients to be knowledgeable and responsible about their health. My office is adjacent to the University of California, San Francisco (UCSF), at 350 Parnassus Avenue, overlooking the City of San Francisco. I enjoy medical academics and research as well. I’ve written over 20 editions of the “Endocrine Disorders” chapter for the textbook Current Medical Diagnosis and Treatment (CMDT) and 4 editions of a chapter for Basic and Clinical Endocrinology. Each is the world’s top textbook in its field. I’ve also published two editions of my own textbook, Handbook of Clinical Endocrinology. My colleagues and I deliver lectures at symposia and publish papers in peer-reviewed journals. See Curriculum Vitae. We don’t accept insurance assignment, but we provide our patients with statements to send to their insurance carrier for reimbursement. We bill insurance for hospitalized patients. Nationally board-certified in both Internal Medicine and Endocrinology & Metabolism. Author of 15 editions of the "Endocrine Disorders" chapter for the textbook Current Medical Diagnosis and Treatment (CMDT), and 3 editions of a chapter for Basic and Clinical Endocrinology. Editor of two editions of Handbook of Clinical Endocrinology.